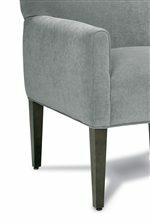 Welcome this Upholstered Chair into your home today. Whether as a companion pieces to your sofa or sit-alone statements, this chair will offer seating that won't fail to fit in. Available in over 500 fabrics for you to custom order and make this chair fit in with your own unique style. It features an attached back, track arms, and exposed wood legs. It has a very contemporary and casual look that will enhance any room decor with its simple and straight-lined design. Make this chair apart of your home for years to come. The Aster Upholstered Exposed Wood Chair by Rowe at AHFA in the area. Product availability may vary. Contact us for the most current availability on this product. The Aster collection is a great option if you are looking for Contemporary furniture in the area.